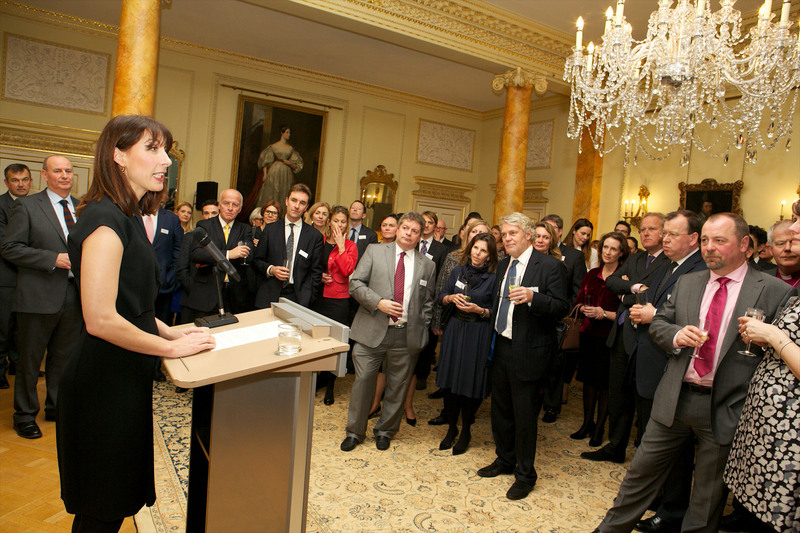 On Tuesday February 11th, Charity Manager Diane Leicester-Hallam joined Action on Addiction (AonA)- the country’s leading addiction support charity – at 10 Downing Street for a celebratory event hosted by Samantha Cameron. The event was organised by AonA to show its appreciation of the extraordinary support of 100 Women in Hedge Funds (100WHF). Action on Addiction was chosen as 100WHF’s Charity of the Year for 2013 and has enjoyed tremendous support throughout the year. 100WHF’s philanthropic theme for the year was Mentoring, and 100WHF selected Action on Addiction as its UK Charity of the Year because of their groundbreaking Moving Parents and Children Together (M-PACT) Programme which takes a ‘whole-family’ approach to helping children whose parents have problems with substance misuse and addiction. The programme gives children a voice, prevents them feeling isolated, helps families understand the effects of addiction and empowers them to work together to improve family functioning and safety. Results have included children coming off “At Risk” registers, improving their school attendance and performance and parents seeking treatment for themselves. Over the past year, 100WHF raised over £500,000 net, with proceeds directed towards the Moving Parents and Children Together (M-PACT) Programme. Pharmacist Support began a partnership with Action on Addiction in 2009. Their support offers service users and their family’s, through our Health Support Programme, access to confidential assistance, to specialist addiction counsellors, in-house treatment as well as second stage treatment. This service has supported 119 pharmacists and their families through extremely difficult times, into recovery and back into the workplace since the partnership began. Click here to read more on the impact of this support.